Living in Seattle fosters a certain pessimism when it comes to large companies. Boeing has always been a poster child for employment uncertainty, regularly hiring large numbers of people and just as regularly, laying them off. Now, we have Microsoft and Amgen joining the club, with Microsoft layoffs impacting an estimate 1350 people in the area, and Amgen, planning to shed 660 jobs when it closes facilities in Seattle and Bothell. Sometimes as a biotech educator, it’s hard to reconcile the prospects of knowing we're training students for well-paying, interesting biotech jobs, with the reality that those jobs may not last. 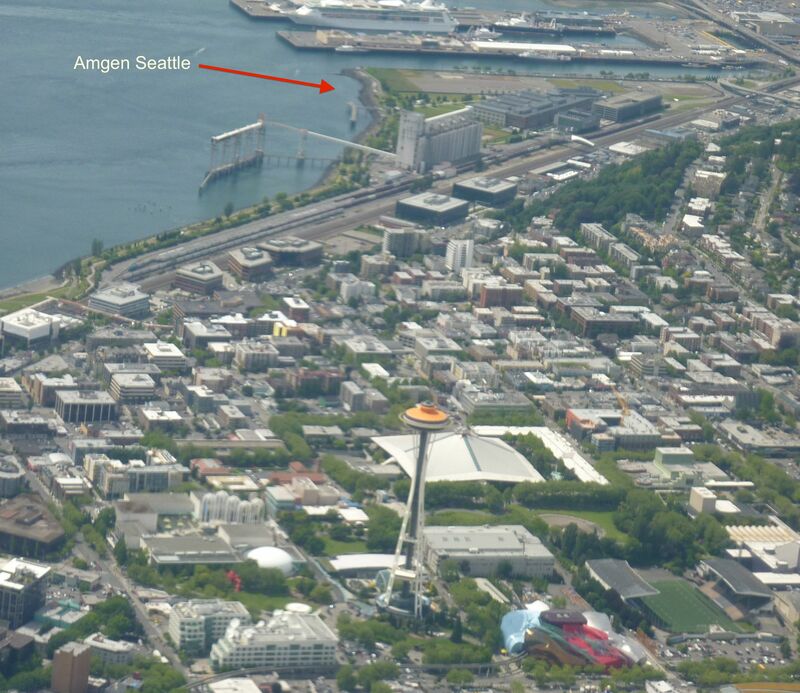 The soon-to-be former Amgen campus in Seattle. In general, we know that preparing students for STEM (Science, Tech, Engineering, Math) jobs is a good thing. On a large scale, statistics show these jobs have higher pay levels and better satisfaction. Yet, there’s that pesky knowledge that companies do change hands, good times might be temporary, and even large, established, companies like Pfizer will try to move overseas just to improve the bottom line. At some level, perhaps, many knew the days of large, fully integrated biotech and biopharmaceutical companies were ending. Peter Knauer, speaking at the recent BioMan confererence, at Salt Lake Community College, described this shift. Knauer described a decade where billions of dollars were invested in research and development and those investments did not pay off. This problem led to intense pressure from Wall Street to increase shareholder value, which led to lots of mergers and acquisitions and incentives to eliminate redundancies. Now, we have fewer large biopharmaceutical companies, and lots of smaller nimble companies, with lean margins, selling contract services. There are contract research organizations (CROs) carrying out R & D, contract manufacturing organizations (CMOs) manufacturing proteins and molecules for testing, and companies that manage clinical trials on contract, and everything else. Life has changed, as we knew it. But this question remains for biotech educators: “how do we prepare students for this new landscape?” Despite Amgen's departure, there is some good news. Our alumni, the biotechnicians, have learned the skills that will help them navigate this new landscape and manage in this transition. PhD level scientists, with more narrow training, may struggle but chances are there will always be jobs for people with solid bench skills. Good laboratory skills, the ability to follow GMPs (Good Manufacturing Practices) and GLPs (Good Laboratory Practices), document and reproduce laboratory experiments are highly valued in the new reality as well as the old. Washington and Colorado might also take some consolation in knowing that we have a new industry where ex-Amgen employees might go. Perhaps some of the 660 folks who will be laid off in Washington, and 430 former Amgen employees in Colorado, will get jobs in the new legal marijuana industry. Their lab skills will certainly transfer and a benefit might be fewer hash oil explosions once the experienced biotechnicians get involved.